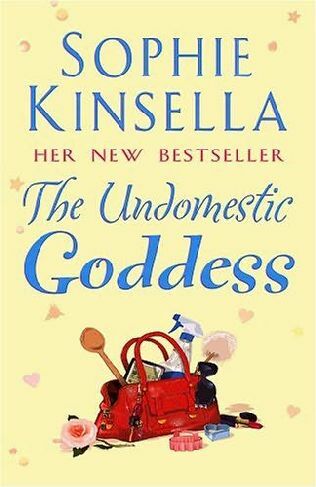 I finished a book on my one day off - Kinsella's The Undomestic Goddess . Samantha Sweeting is really something. She was at the top of her game and then the whole world crashes down on her. She makes rash decisions, but those eventually lead to her happiness. Nah, that's not really it. I want to be free like her, to finally find the life she can be truly happy with. Don't get me wrong, I am happy as it is. But sometimes, I still think about leaving my job behind and doing something completely different. Work isn't as stressful as Sam's lawyering, but it is busy. And lately, there's absolutely no "just be" time at work. No one's imposing that I don't take my breaks, but with the volume of things that need to be done - I can't help but forget to go on break. Haha. Anyway, if you enjoyed Kinsella's writing in the Shopaholic series, then you'll like this one too. It's very easy and light reading (specially compared to Les Miz - which I still haven't finished). It's a bit too good to be true, like would things like this happen in real life? But that's the wonder of books - anything can happen. The book had a very light approach to the debate on where women belong - at work or at home. It wasn't imposing for either side. I guess what it did was come across to let women know that ultimately, it is their choice. Samantha was brought up to look forward to just one goal - to build a career at law and be the best in that field. She owned that dream and her whole life revolved in making it happen. An unfortunate event yanked her out from that life. She went into shockand acted in panic. And though there could have been so many bad situations she could have found herself in as a result, it was the Geigers and Lower Ebury that actually saved her. She really did sound like a woman coming out from a bad relationship - someone who needed healing. And what a great rehab she found! Iris, who was like a mom to her, did not just teach her to cook, but taught her how to taste, and feel. Sometimes I feel like novels like this shouldn't include a hunk of a man, so that there's no confusion about what drives the heroine to the choice she makes. Would she really have chosen her new life had there been no Nathaniel?